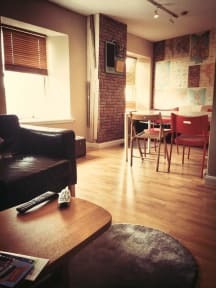 The hostel was really good fun, the shared spaces were a great way to meet new people from everywhere, the bed comfortable and clean staff very accommodating and excellent Location. For me, Inverness is a place to break a journey, shop and get to other places from. 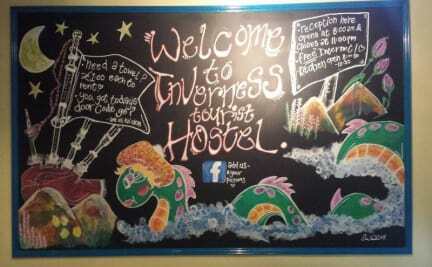 Inverness Tourist Hostel is a cheap place to do this from if you have to stay the night and has the great advantage of being right next to the bus station and close to the railway station. Laid-back, friendly staff, left luggage, needs a bigger fridge and the kitchen doesn't open until after 8am (supposedly for fire regulation reasons), which can be a pain with an early transport connection (good cafe nearby). The location of the hostel is brillant, its very easy to find as it's right next to the bus station. The staff are all very friendly and always willing to chat so the atmosphere was good. The rooms are pretty basic and I think the shower rooms could be a little cleaner. At times, you can strongly smell weed which not everyone will be happy with. Thus, it's a very good place if you're only stopping for a couple of nights. This hostel had a lot of potential, it’s not living up to it. There were good kitchen/lounge facilities, but their atmosphere was drowned out by staff blasting gangster rap; I like rap but it was awful rap, which will be off putting for some. Some of the staff seemed so over volunteering there that they seemed inconvenienced by me asking about how to work the oven by replying, “I’m not working now.” I realize volunteering gets old, but attitude check mate. On the contrary, staff were great. Cheap place to stay however did not find it to be a social hostel and quite dark inside. Goes by Backpacker's Hostel. Has what you would expect but nothing extra. Location is extremely convenient to bus station, within view of front door. Shower door did not work well, walls were extremely thin so you could hear people argue at 3:30am coming back from the pubs. Cheapest hostel I could find and the only available that day but I do not think I would stay again. No one at reception during hours they said there would be someone so I had to leave my keys without "checking out." The location was great and the overall building was okay but the staff were not organized. They only accept cash and I'm not sure if the site said that but in to my knowledge there was no information given beforehand. The bed that I was supposed to stay on was not made when I arrived and there was another person who arrived at the same time with me who had the same problem. There seemed to be at least 3-4 miscommunication problems that I observed with the staff. but they were friendly! Two words: black mould. Fine location, abysmal cleanliness. Avoid. Avoid!!! When my group arrived there, after much initial confusion, it was made clear to us that they did not have enough beds for us, despite our booking and paying in advance, so we had to find a new place at midnight. The receptionist was no help at all, and the place looked truly neglected (from the out of order signs hanging everywhere to the general atmosphere). We eventually managed to be reimbursed, but were thoroughly disappointed and angered by the incompetence of the staff.